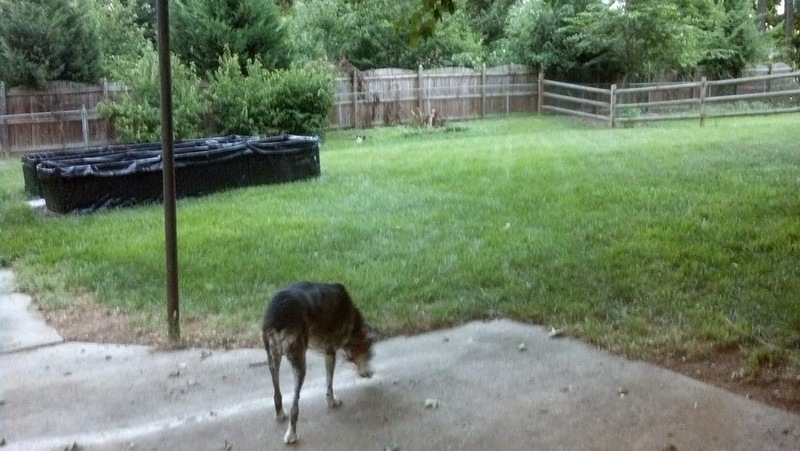 On Monday when I let Binkley out there was a cat in the backyard, but he never saw it. If you look in the photo below you can see it to the right of the raised black beds. That cat spends a lot of time in our yard, but apparently it's just a resting place as there are more chipmunks than ever. Sometimes I will see it and crouch down calling to it without result. It usually just stares at me and when it gets bored, just casually walks away. 100% cat. 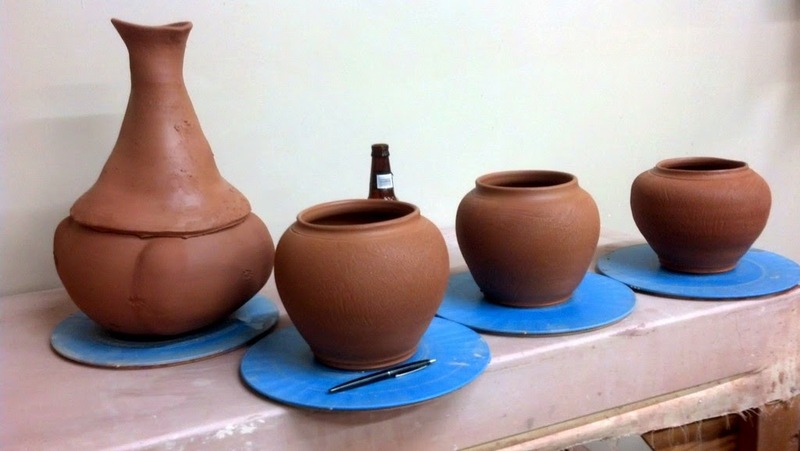 Later I went to Clayworks and made some crock-type pots. I need a new one to hold my wooden spoons and spatulas since the one Karen bought me about twenty years ago recently cracked. I'm not sure what I want to do with the surface of these. I might finally try my hand at slip transfer. We'll see. 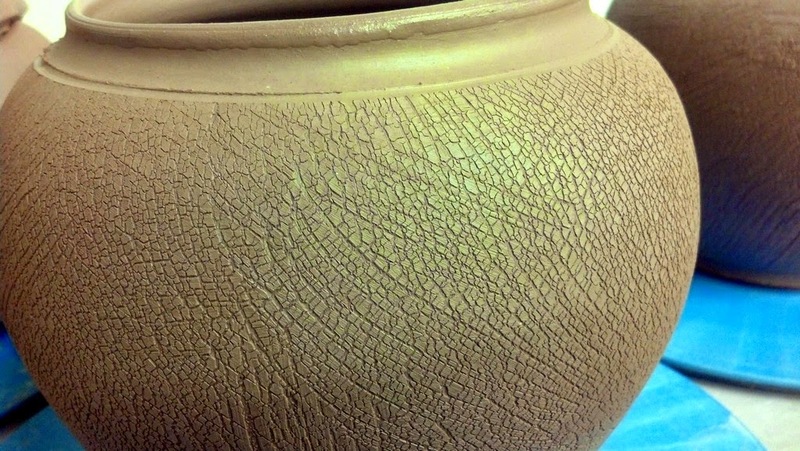 I also further pushed out some of the crackled pots I made earlier. 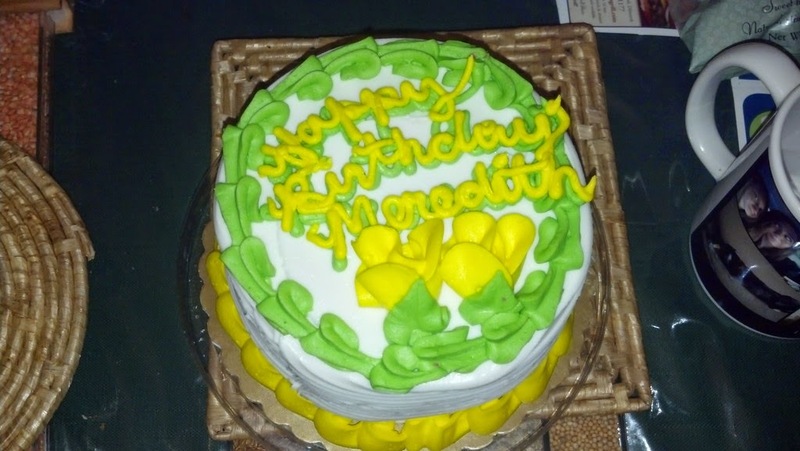 Sunday was Meredith's birthday and she came home for a visit. Stephanie came home too and it was nice having a full house for a few days. Binkley sure liked having the girls here. I cooked a couple of meals for the whole family for a change and even baked a lemon cake (not the one pictured below). All too soon Stephanie had to get back for work and Meredith had to leave a few days later. Life went back to what is now normal, but it was a nice glimpse of the way it used to be around here. 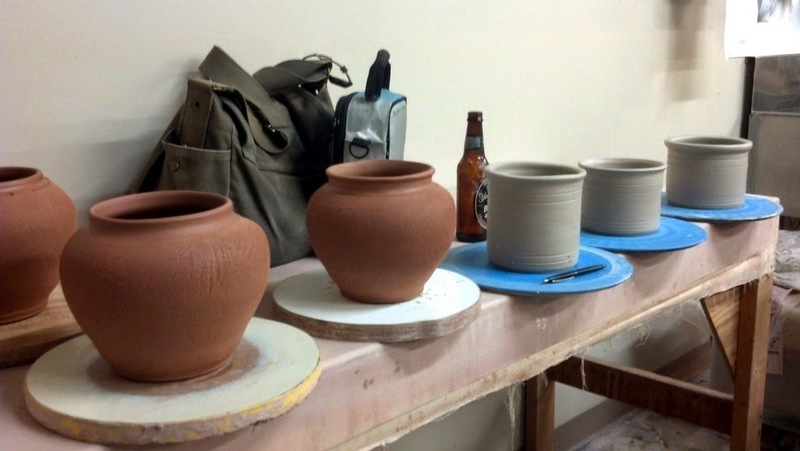 Saturday I spent about four hours at Clayworks where I made a two-piece pot and some crackled pots. It was a good studio day. 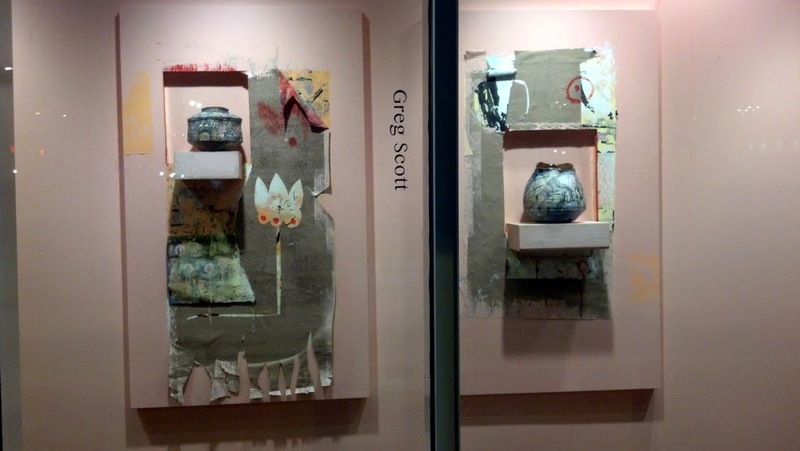 I heard about Greg Scott's opening at UNCC Center City at the last minute and decided I needed to go. 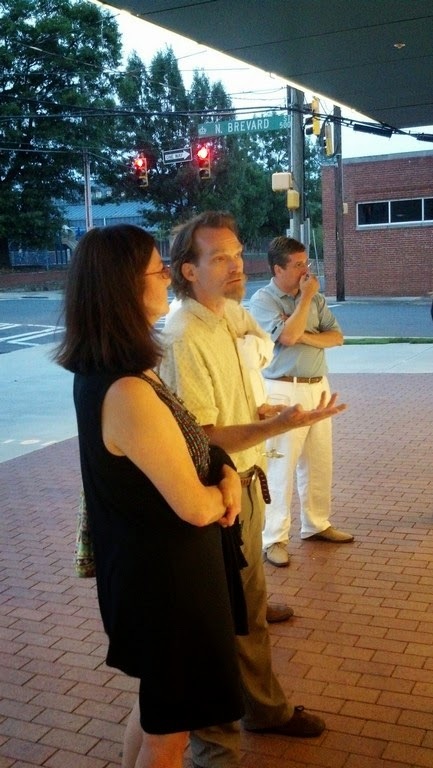 Chroma is an exhibit of two 2D artists, Linda Luise Brown and Marge Loudon Moody, Greg Scott as a 3D artist, and Dan Knight played an original piano piece for the opening. Each artist gave a short talk about their art and their methods which I found very interesting. Mr. Knight's music was wonderful and he explained afterward that he was planning on going a different way with it, but did something else once he started playing. Greg had a similar experience with this show as he also had to make some last-minute changes on Saturday afternoon due to a kiln mishap. 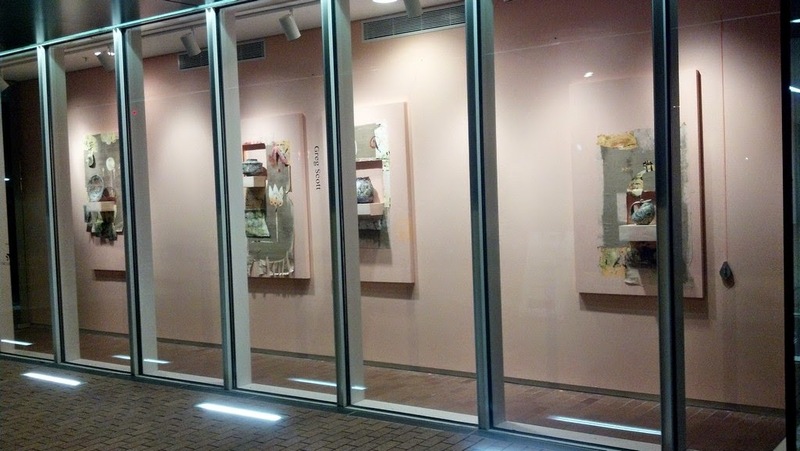 His work showed very well even with the changes and he has the coveted real estate in the front window of the building. I highly recommend seeing this if you are in the area. All the pieces in this collection have different styles but overlap on their color palette. 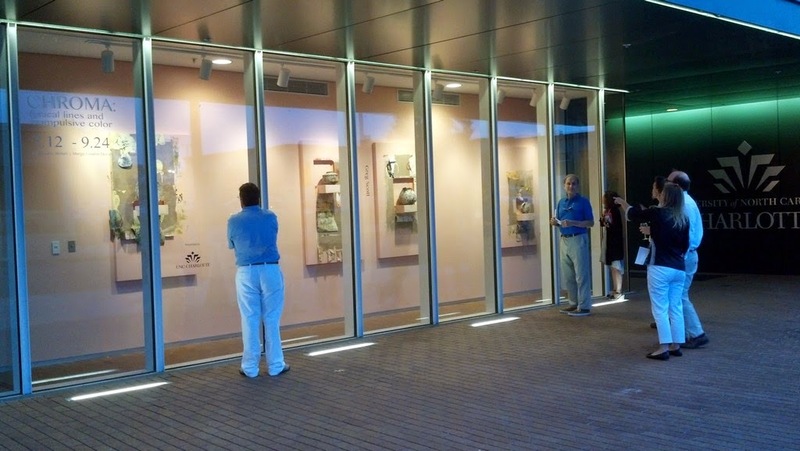 It's quite striking and will be on display until September 24, 2014. 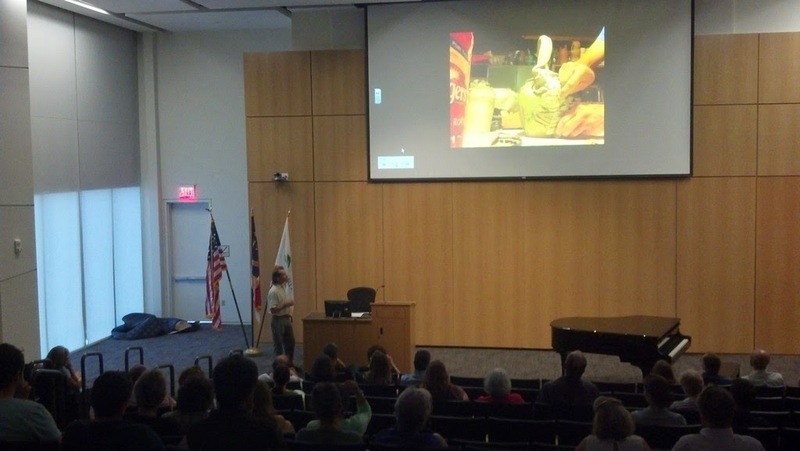 Dan Knight plays during the slideshow. 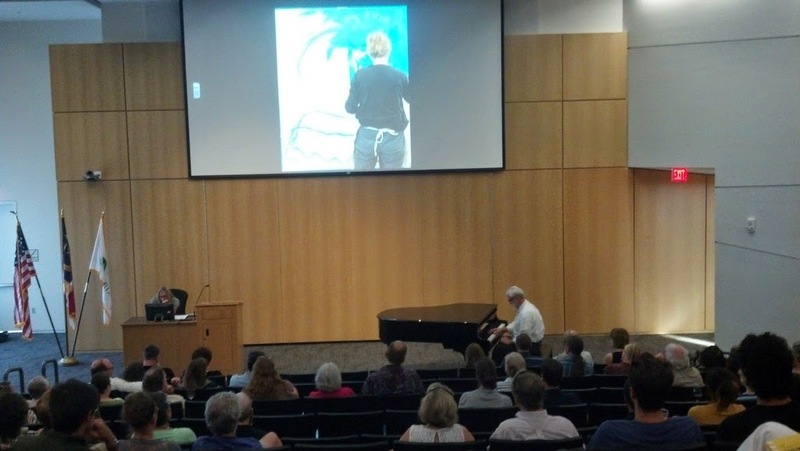 Greg giving his talk about his art. 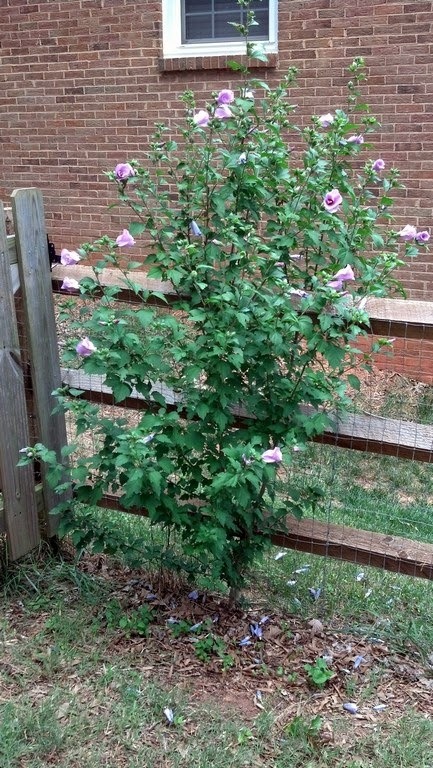 This Rose of Sharon hibiscus (hibiscus syriacus) sprouted on its own last year with lots of flowers and has really grown this year. 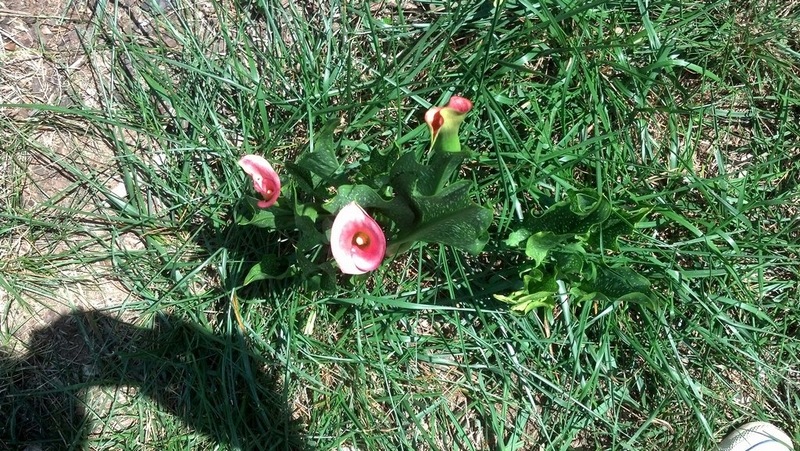 I saved some seeds from last year and will try to get some from this year so I can plant more of them along the fence. They really are beautiful and quite hardy. Even though it's growing in the fence it's got a nice shape. 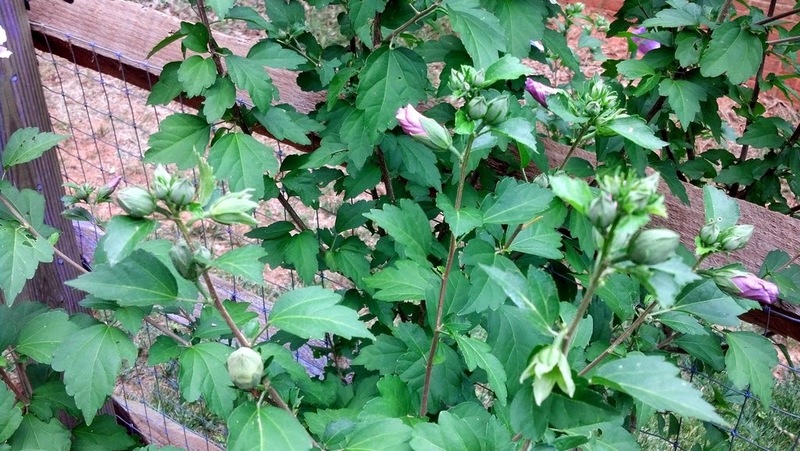 There are plenty more buds waiting to pop. 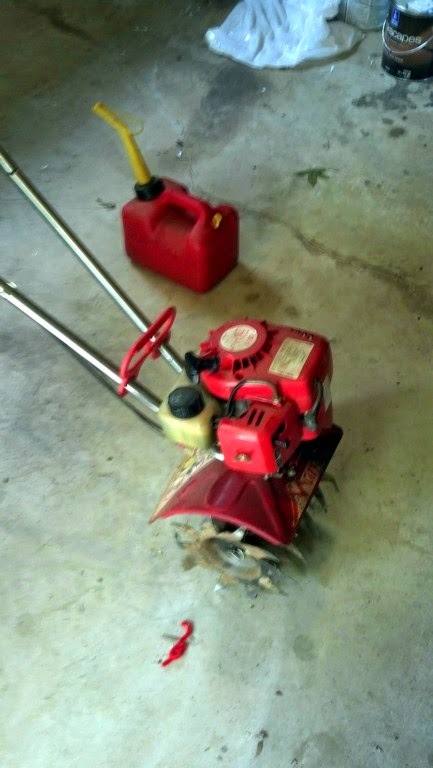 Tuesday I repaired the tiller, and luckily it was a quick fix. 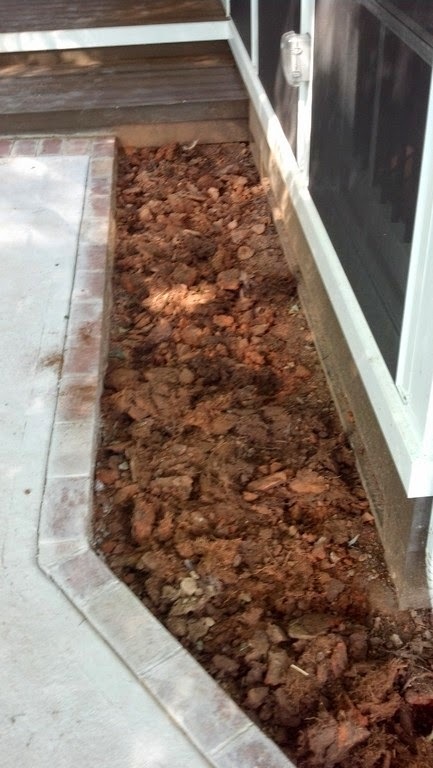 I broke up the chunks from yesterday, added 400 lbs of topsoil and 4 bags of mushroom compost, and tilled it all in. 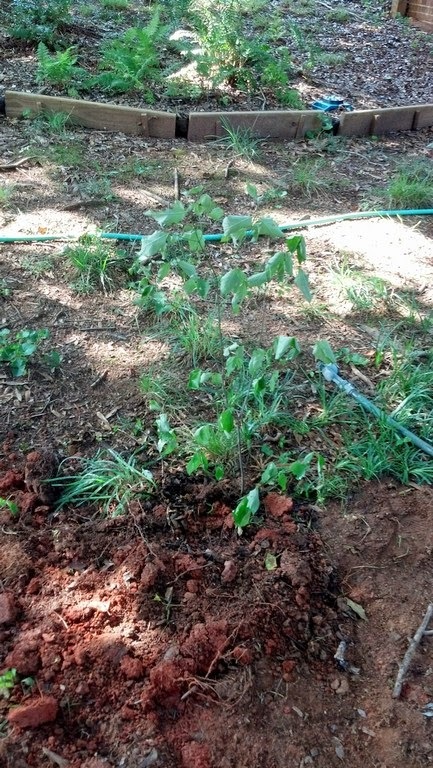 I planted the nandinas after chopping out several maple tree roots. I had to work around the larger roots which were as thick as my arm. 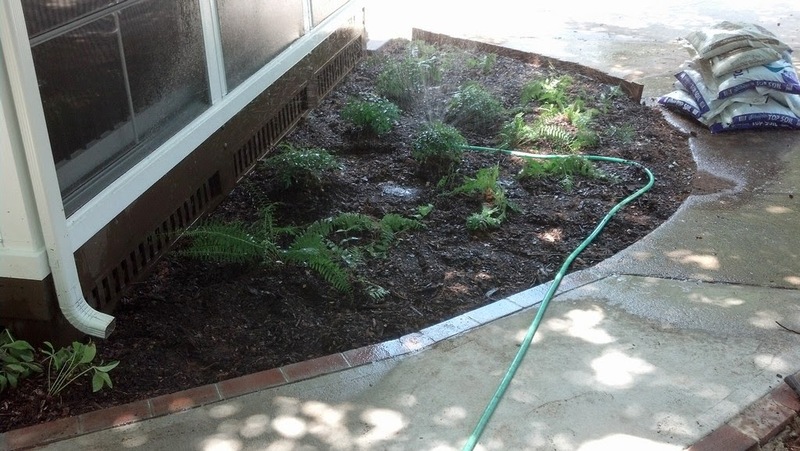 I then planted the ferns from the plant rescue, and some lenten roses from friends. 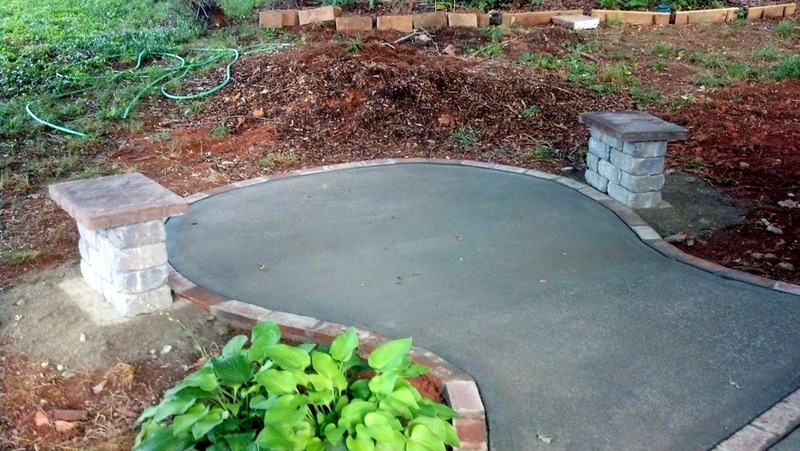 Once that was done I top-dressed it with some partially composted hardwood mulch that has been in the yard for a couple of years. Rich stuff. The temperature was 78 F when I started and it was 93 F when I finished. If we sweat out our toxins I believe I am currently toxin-free. 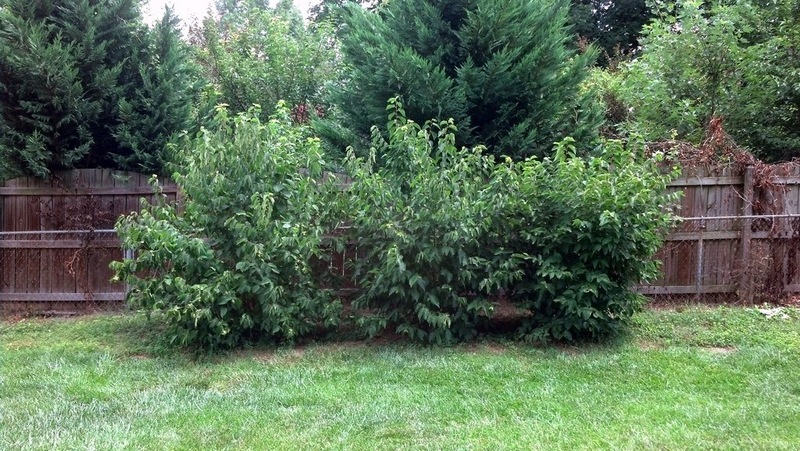 I'm sad to report that the dogwood did not make it. 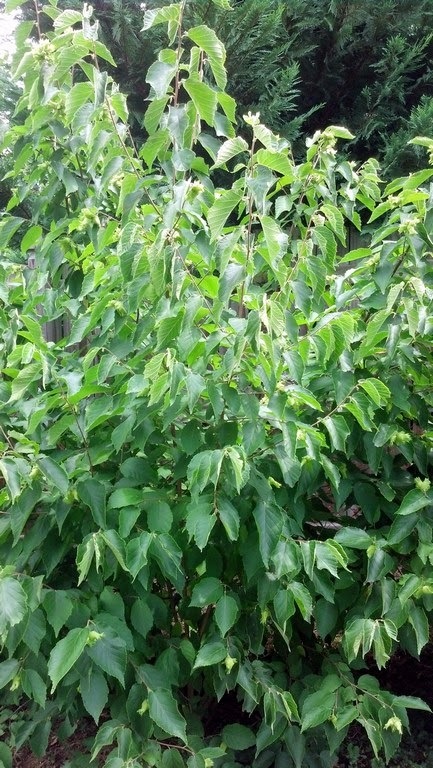 I think I am just not supposed to have a dogwood tree. While cooling down before heading inside, I snapped a photo of the callow lily by the raised garden beds and the boardwalk I put between the beds. 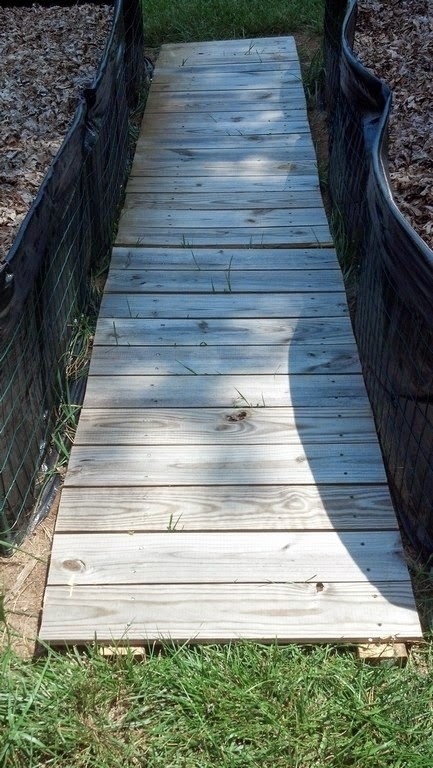 On Saturday I ripped an old section of dog eared fence to make the walk. I really need to plant more of these. 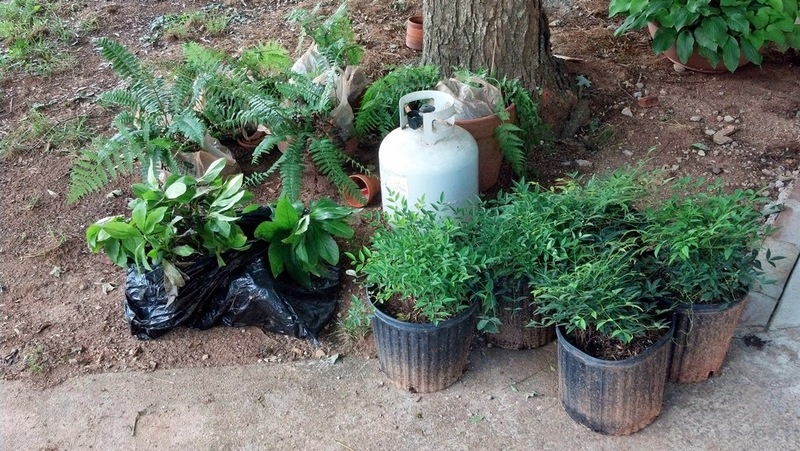 On Sunday we made a plant rescue run, and got some more ferns and a dogwood. Let's see if I can get this one to live. 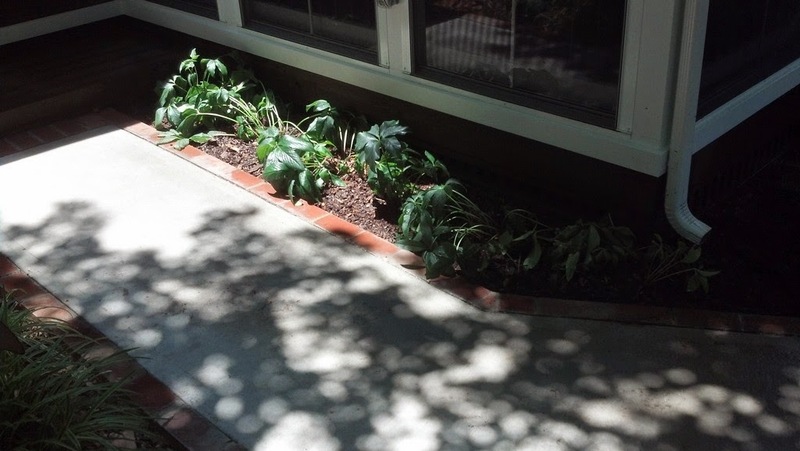 On the right below are some dwarf nandinas that I purchased at a local greenhouse. 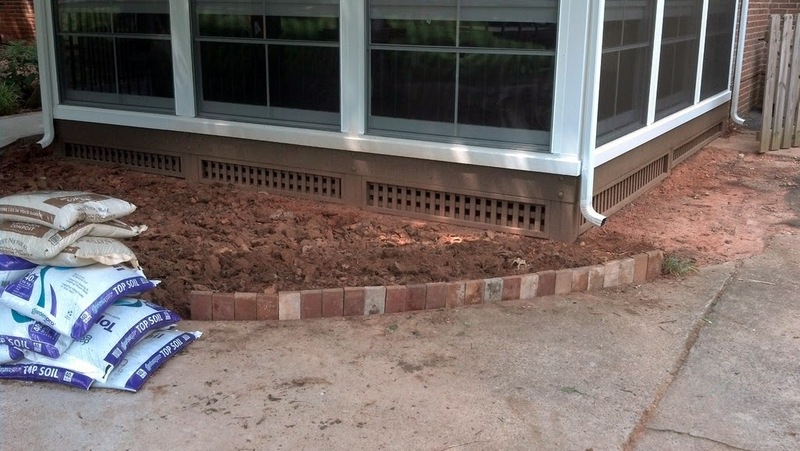 I am going to use the nandinas and ferns in the new flowerbeds by the porch, but first I have to till the soil up and amend it. 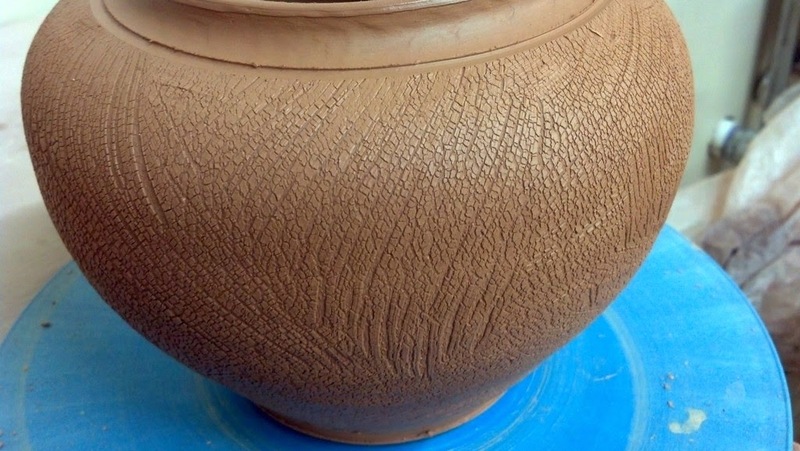 I have a small Mantis tiller that works great on many things, but rock-hard clay is not one of them. I turned over the beds with a pitchfork and shovel which was no easy feat. 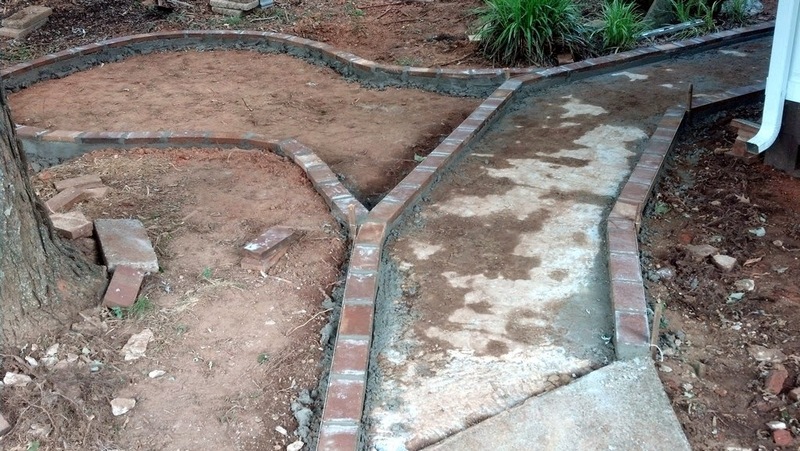 I planned on using the tiller to break up the chunks and mix in the amendments. Unfortunately the primer bulb on the Mantis had cracked over the winter so I had to go get replacement parts. 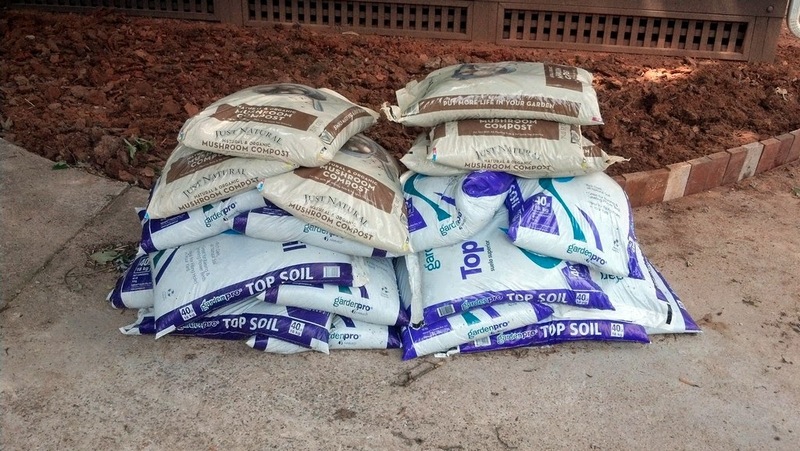 I purchased 800 lbs of topsoil and six bags of mushroom compost to add to the clay, but I guess they will have to wait until tomorrow when I get the tiller back together. 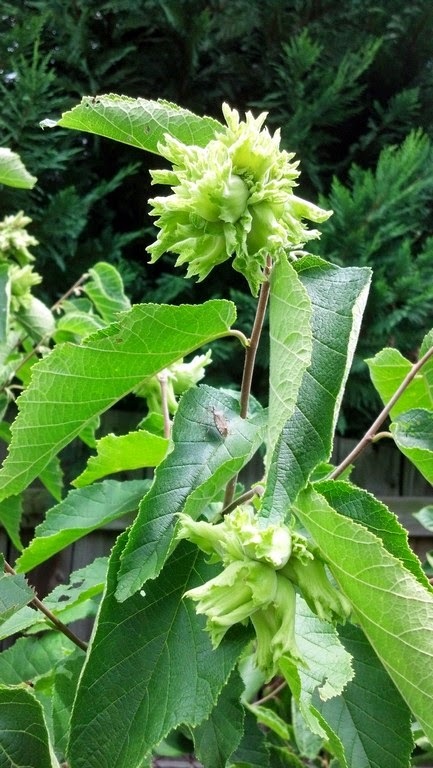 My friend Nick gave me some hazelnuts a couple of years ago and they have really leapt this year. 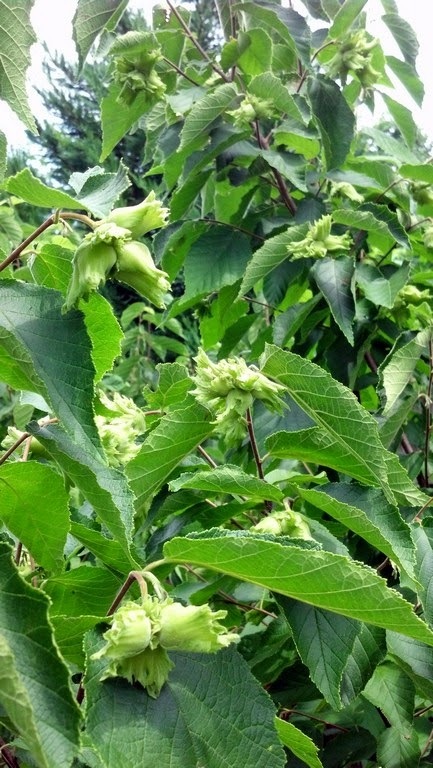 They are a formidable size and two of the three are absolutely laden with nut clusters. I have never seen so many nuts in each cluster before. Unfortunately I have to wait for a month or more for them to ripen and last year the day the ripened the deer took all but two of them overnight. The dogwood is pretty droopy. Finally! This stuff is like concrete. nice rain barrels with planters on top. 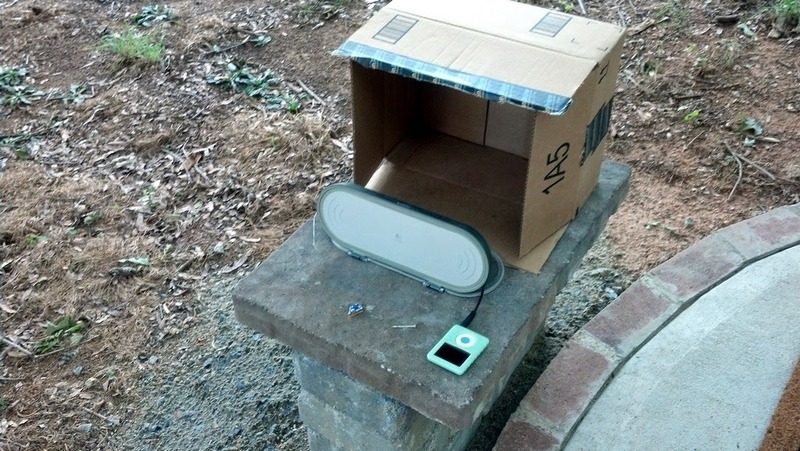 Tuneage makes the job go easier. 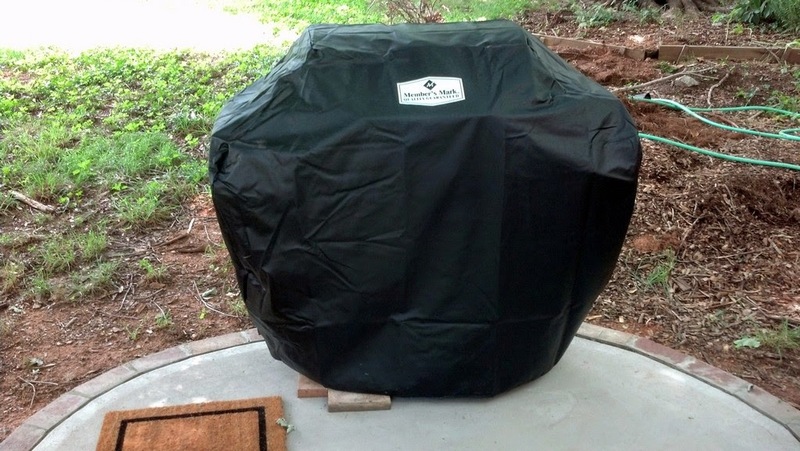 Oh yeah, the grill came with a cover. The hazelnuts are quite large. Lots of pods on each branch. 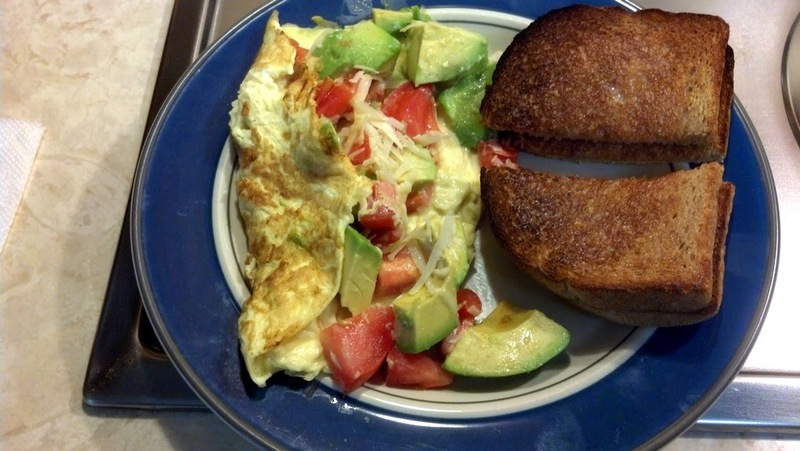 Sunday I made one of my favorite omelets that I get when we go to Toast. It's got tomato, avocado, and parmigiano reggiano cheese. It turned out great and I will be making this again in the future. I purchased some lilies at the supermarket to replace the fading roses from last week. When I got home with them I decided the roses still had some life left in them so I just pushed the lilies into the middle. I frequently buy the marked down flowers at Harris Teeter. 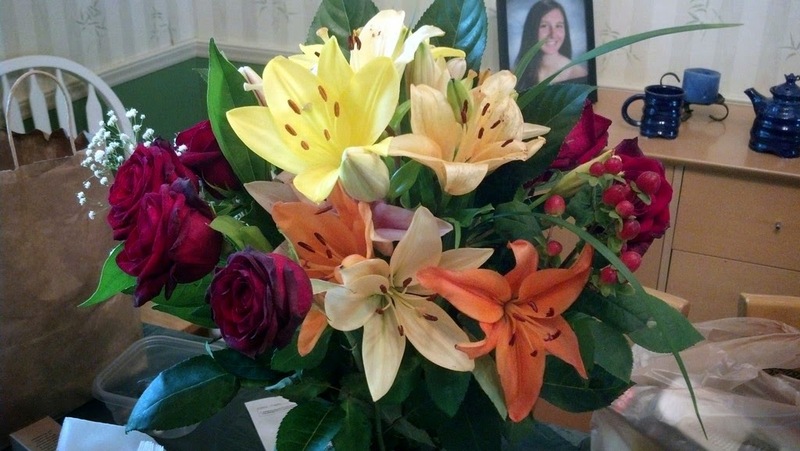 It's hard to beat a $3.00 bouquet of flowers. I also picked up some Aunt Nellie's red cabbage. 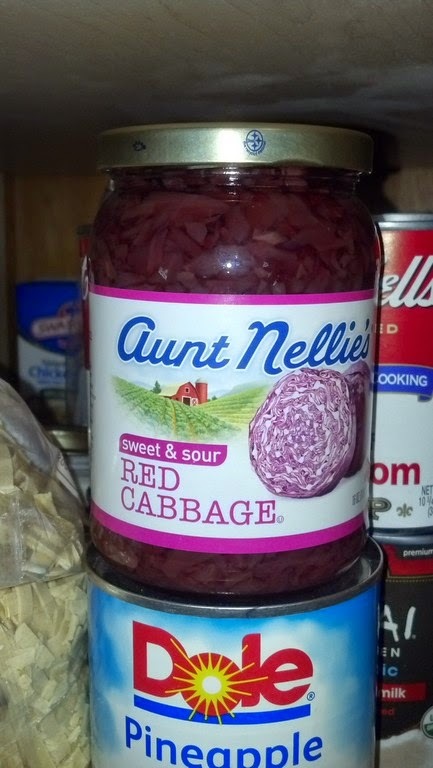 I've never met Aunt Nellie, but she sure makes some good red cabbage. Saturday I assembled the grill and set it in place on it's new patio. 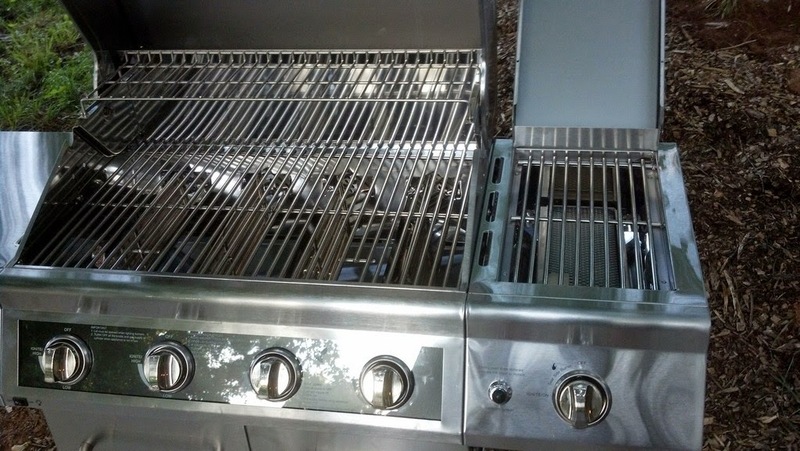 The grill is all stainless steel and has a searing burner on the side. 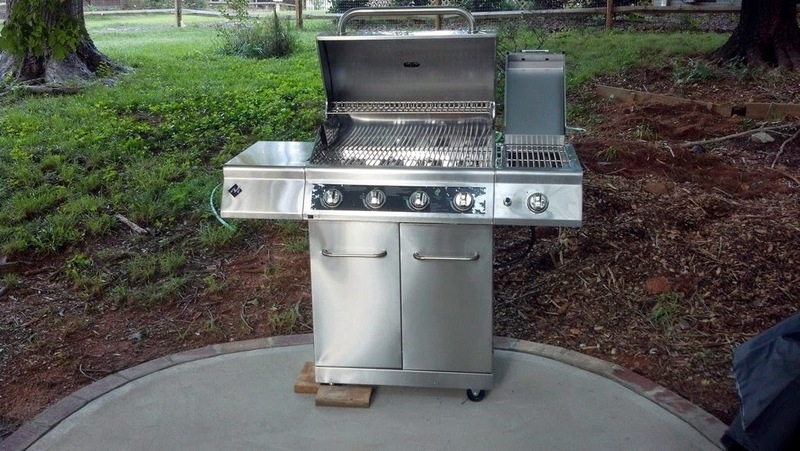 We looked at a lot of grills before settling on this one. There are many options out there, from searing burners to removable pizza stones, but this one should serve us well. It even has a slide-out tray for the propane tank, just right for old people like me. There is a switch to light up the control panel, which seems kind of silly to me, but I guess having too many features is better than too few. Friday the weather was absolutely wonderful, cooler than average temperatures and very low humidity. We couldn't remember a more pleasant 4th of July. 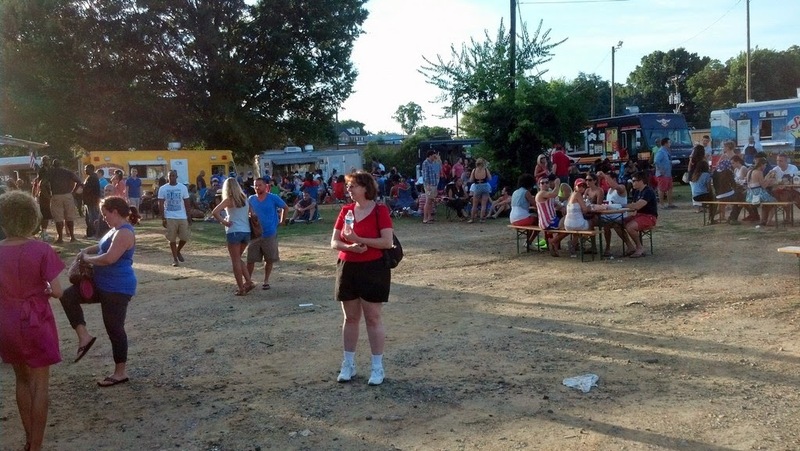 We went to the Southend gallery crawl and food truck circle. We took the light rail thinking it wouldn't be too crowded because everyone was already at the sold out baseball game. The downtown fireworks were going to be at the end of the game. Apparently a LOT of people were taking the train downtown to hang out and wait for the fireworks without attending the game. We ate, visited some galleries, and beat a hasty retreat before the crowds would be leaving downtown. During our train ride I was taken by the beautiful sunset, but couldn't snap a good photo from the moving train. 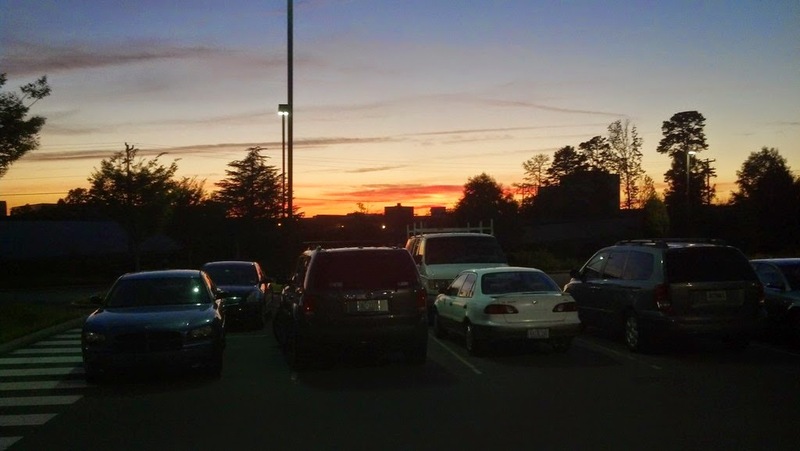 I grabbed the photo below in the parking lot after we left the train, but it was very much in decline by that point. We went to TCBY and on the way back we drove through the neighborhood where we kept hearing some loud fireworks. We followed the sound down to the park and found about twenty families lined up with canvas chairs. They were putting on some very expensive displays, the kind of mortar-type shells that yield very professional results. We sat in the car and enjoyed the show, the night, the low temperatures and each other's company. 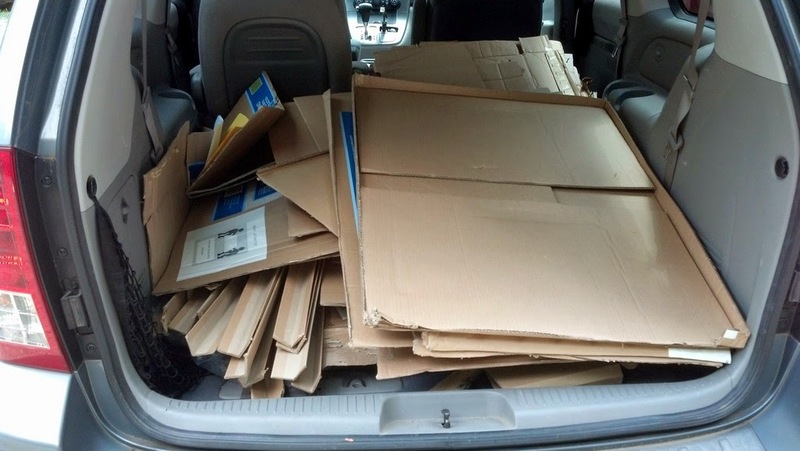 After assembling a large group of the porch furniture it was time to take the excess cardboard to the recycling center. It turned out to be quite a load. 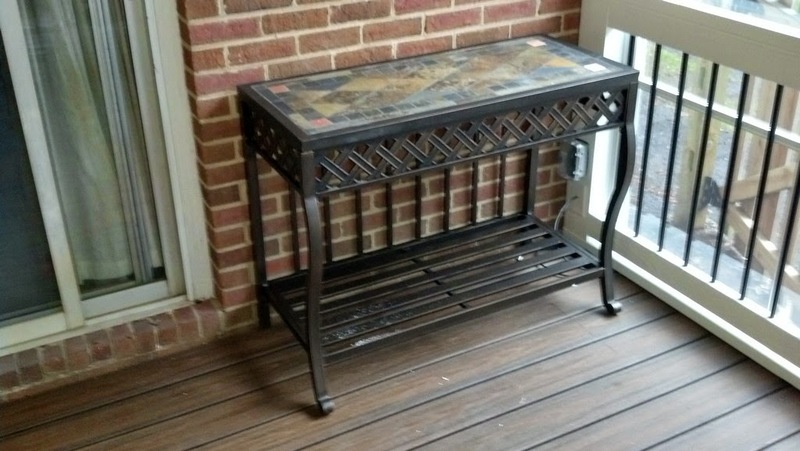 Just think, I still have a serving cart and a gas grill to put together. Sounds like another trip. It's official: both of our children made the dean's list! Needless to say, I am one proud father. My wife has a college degree which took her five schools and nine and a half years to complete at night while working full time. 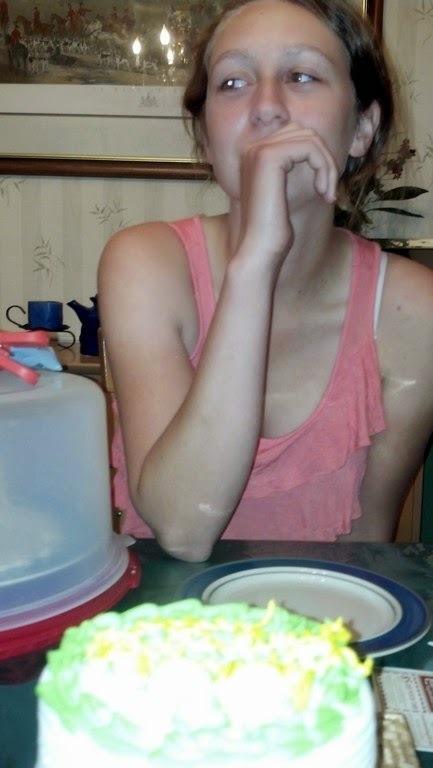 I am very proud of her accomplishments. I never went to college. I tested for a scholarship to art school, but didn't get it. They accepted my application, but I couldn't afford the tuition and the cost of commuting. Our daughters will be the first in my immediate family to graduate from college so it's going to be very emotional when they take their walk across the stage. The fact that they are both excelling at things that they love makes me want to leap for joy. I am thrilled that they have both found interests that they are passionate about at such a young age. I still don't know what I want to be (if) when I grow up. Saturday I tackled the large box of furniture that has been patiently waiting in the garage. 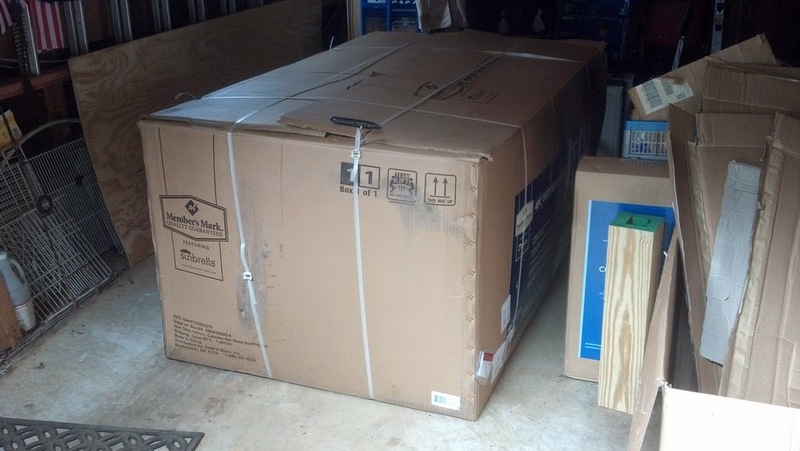 It was a HUGE box which contained a couch, two chairs, and a coffee table. Of course, the couch and table had to be assembled... The assembly was a bit frustrating but everything worked with a bit of patience and planning. The chairs are swivel/gliders and have a really ingenious mechanism under them to accomplish this feat. They're also very comfortable. I ended up working on the couch in the garage during the hottest part of a very humid day so when it was time to assemble the coffee table I brought it into the porch. I closed the windows, opened the sliding door into the air conditioned den and turned on the ceiling fans. 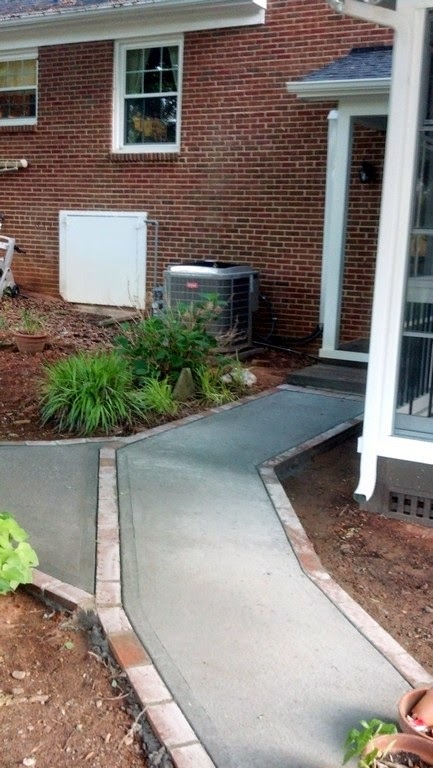 I was pleased to find out that the porch holds the cooler air from the house very nicely. It was actually pleasant out there and I took advantage of it to assemble another table. 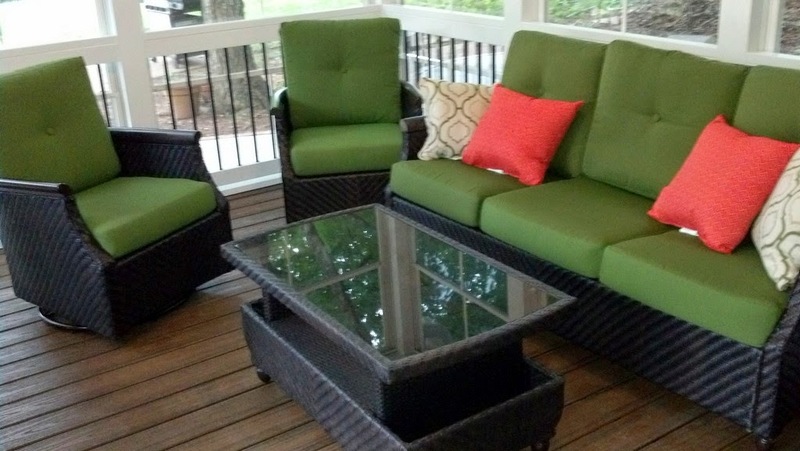 The first thing we bought for the porch was a large table and six chairs at BJ's Wholesale Club. I'll have to get a photo of that set on here soon. While we were there we also purchased a side table and utility cart that both matched the main table. I assembled the side table on Saturday which leaves only the cart left to do. Large box? That's my razor knife on top for scale. 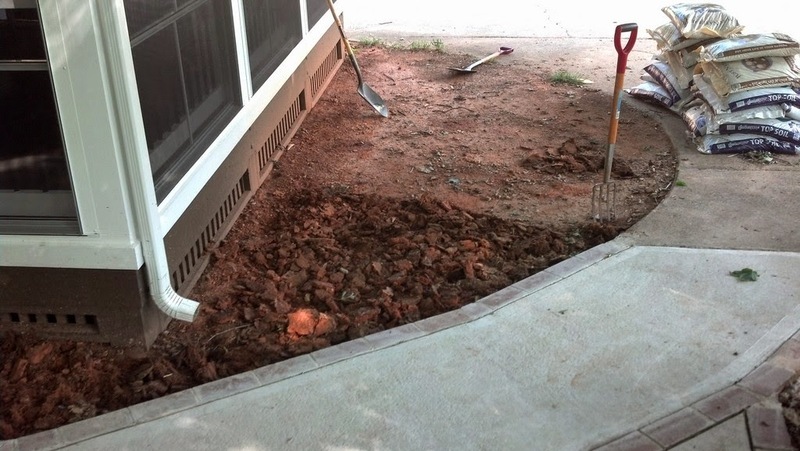 Wednesday the guys came back added the concrete to the new patio and sidewalk. 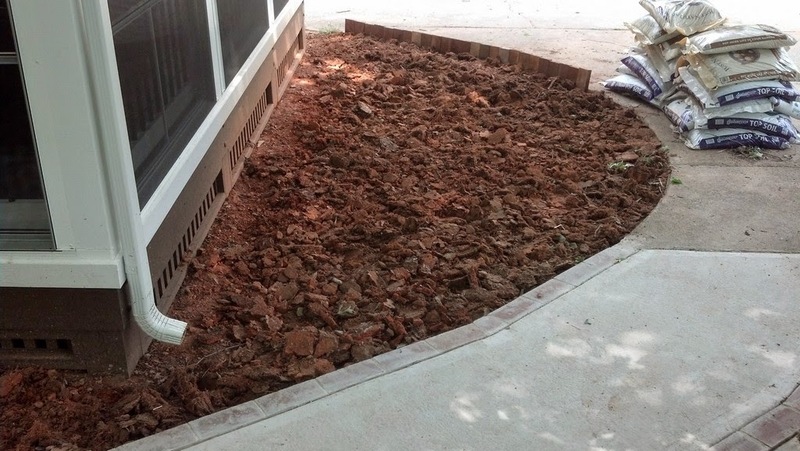 They brought in the dry mix in a small trailer and mixed it in "volcano" in the driveway as needed. It was wheelbarrowed into the forms, screeded, floated, textured, and edged. Two seats were added to the patio to make grilling a bit more of a social affair. 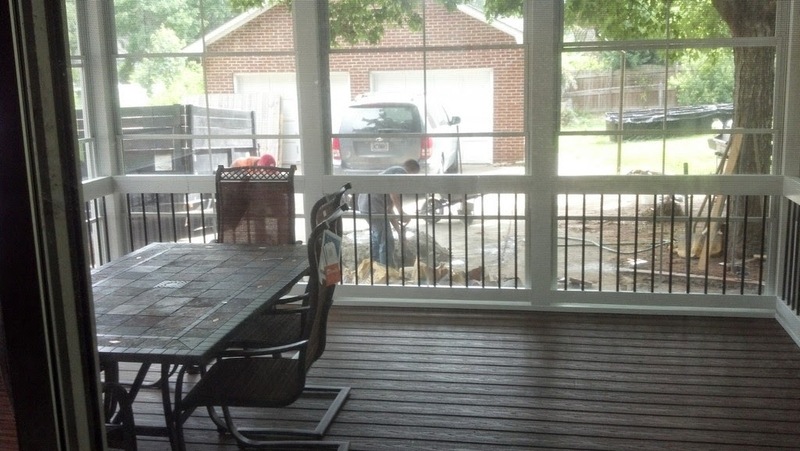 Since we had the old deck removed we need a new place to put our gas grill. 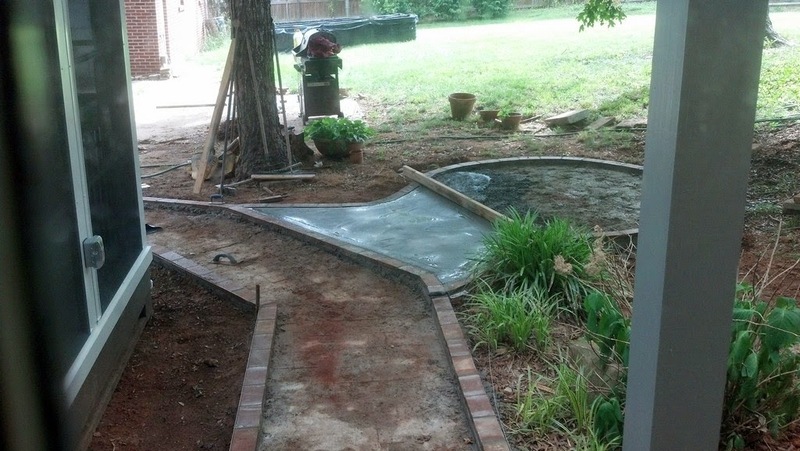 We want to tie it into the existing walkway and update the walkway at the same time. We called Home Sweet Home to do the work as our neighbor uses them frequently. 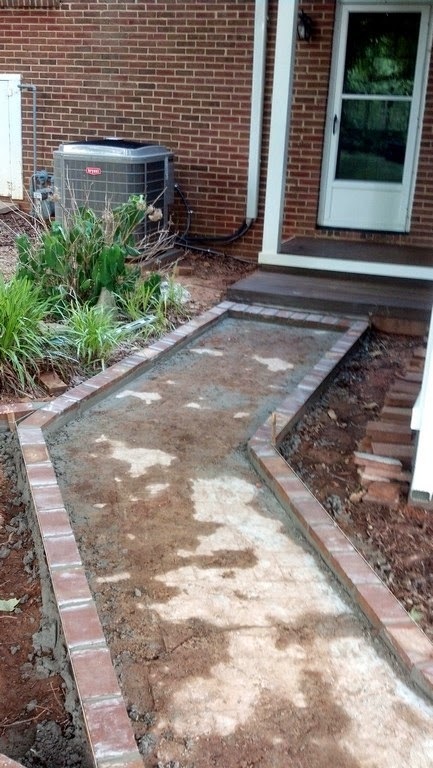 They used the pavers that used to make up our old sidewalk as a border --and a form for the concrete.